Thousands of Aussie motorists have pledged their support on social media for a two-day national fuel strike, which began this morning, refusing to fill up in hopes of forcing petrol prices down. It all started with a Facebook campaign - which has gained more than 150,000 supporters - set up by Queensland woman Sabrina Lamont who was sick and tired of dealing with skyrocketing fuel costs. Lamont also launched a petition calling on the Queensland government to remove GST on the fuel excise and launch a Royal Commission into petrol price gouging. It has gained more than 30,000 signatures. "This one day is a day of unity where the whole nation stops together, we're hoping this stand will affect them financially to the point they may just listen," said Lamont. "There are so many Australians struggling right now that just can't afford to buy the fuel anymore, the government either fixes the decision or it won't be getting its taxes." Motoring body RACQ said while they understand people are angry, a boycott isn't the answer. "We think that the best approach for drivers to take is to boycott the most expensive service stations every day of the year," said Spokesperson Lucinda Ross. "Make sure you take a little extra time to find the cheapest spots in your area." 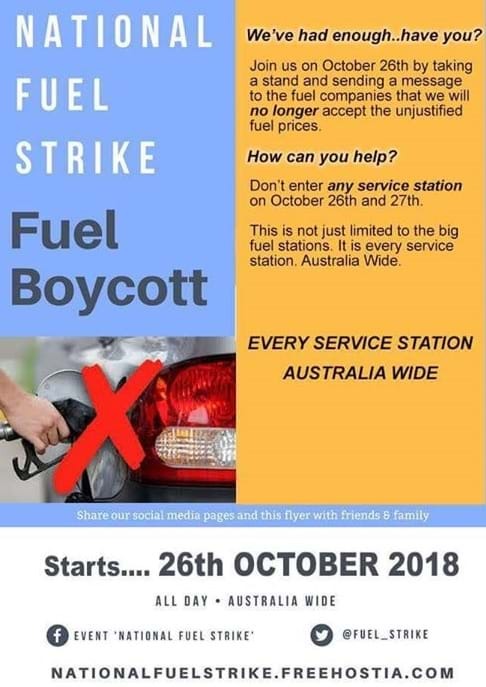 Lamont and her followers have since launched a second boycott campaign, where they will push for motorists to take part in a monthly boycott of service stations across Australia.